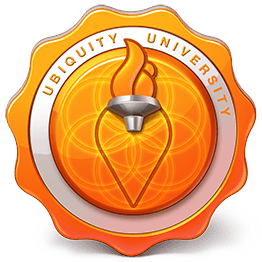 Ubiquity University opens its doors to student enrollment at a time of extraordinary challenge and opportunity. “No sector operates more inefficiently than education,” stated Forbes in a cover story on November 11, 2012, and “a new breed of disruptors is going to fix it.” The article predicted that disruptive education is the key to educational renewal. Ubiquity was conceived to be disruptive. CONTENT: Conventional schools impart knowledge and train students in analytical thinking. Creativity, not simply knowledge, is the key to the jobs of the future. Collaboration, not simply competitiveness, is emerging as critical to success. Ubiquity will provide innovative content by blending learning with innovation, enabling students to gain core competencies for future employment and to develop the creative, collaborative and critical thinking capacities necessary to meet the challenges of the 21st century. METHOD: Conventional education relies on lectures and memorization. Ubiquity’s learning system involves a specially designed website and technology platform through which the student engages in academic studies, personal development exercises, real life missions that provide fully immersive learning and enable students to interact creatively with their peers worldwide. DESIGN: Conventional schools train for degrees. Ubiquity will be completely modular, enabling students to obtain everything from a BA to a Phd as well as certificates and badges for lifelong learners. Ubiquity will also accept transfers from MOOCs and non-traditional education sources so the students can custom design their own learning pathways. Ubiquity concentrates on what the emerging generation of students actually need, for whom digital technology is the new norm and directly relevant learning the emerging demand. AFFORDABILITY: Worldwide student costs and tuition for higher education are dramatically escalating, taking education out of the reach of millions of perfectly qualified students each year. Ubiquity is globally affordable, offering a $12,000 BA and a $12,000 MBA. Low cost. No debt. Globally. GLOBAL CONTEXT: Students are grouped in “pods” designed to create global classrooms in which they will interact with peers from around the world. They will learn their lessons, engage in personal development, and participate in real life missions with other students supported by trained teacher assistants and a coaching and mentoring program. By the time they graduate, they will have developed a global network of their peers, all engaged in collaborative creativity on projects of common concern. Country partners around the world enhance this capacity. IBM studies in 2010 and 2012 interviewed 1700 CEOs and 3,600 students in 60 countries. The conclusion: the critical need now is not for industrial workers but for creative leaders able to think outside the very system that produced them. Why? Because the world has entered the era of hypercomplexity and current forms of education are not preparing young people for the world that is coming. Topping the list of what global CEOs and students are looking for as they face the future are creative thinking, the capacity to collaborate, the capacity to communicate effectively, the capacity to be open, flexible and empathetic, and express global perspectives. Simple technical and mathematical knowledge – that which our schools are currently designed to teach and with which our accrediting agencies are concerned – ranked low on the list. Ubiquity’s curriculum is designed to enhance collaborative creativity, emotional intelligence, innovative entrepreneurship, and personal leadership – the very qualities that both global corporations and young people demand, and to do so at globally affordable tuition. As the 21st Century unfolds, new forms of learning must be implemented to prepare our young for the future that is coming. Educational institutions need to be created that both recognize this and support the revolution itself. This is the immediate and urgent reason for establishing Ubiquity University.